The word “Miami” conjures many thoughts in the mind. Many will immediately think of Miami Vice, the 1980’s, Grand Theft Auto: Vice City, Hotline Miami and all that jazz. But before it all, there was just a small sleepy town in the Everglades. Then, in the early 1920s and has happened in our recent past, there was a real estate bubble. Money and investment poured in. Miami styled itself as a tropical paradise where anyone could buy their own bit of land and have the home they’d always wanted. In classic pursuit of the American Dream, advertising posters bore pictures of old ships with their sails unfurled, proudly proclaiming “Follow the Golden Galleon: Where your ‘Castles in Spain’ are made real!” whilst on Times Square a massive lit hoarding read “It’s June in Miami”. But as with any boom, the bust soon followed. Investors became concerned that there was rampant over-speculation. The railroad companies started embargoing non-essential material due to freight making the rail network unusable, and when the schooner Prinz Valdemar sank in the mouth of Miami harbour in 1926, it effectively blocked the port from receiving building supplies fuelling the construction projects. The bubble had burst. A Golden Wake is an adventure game set amongst the heady backdrop of the 1920s Florida land boom. Whilst it is a fascinating and inspired setting for a game, A Golden Wake does unfortunately suffer from two major problems. First, whilst it tries its best to weave a tale of intrigue and eventually crime in humid Miami, it isn’t entirely successful in this endeavour due to some lacklustre scripting and a story that doesn’t quite come together. Its other problem is that it sadly falls into the trap of being “just another adventure game”, with nothing differentiating the gameplay from a myriad of games before it, being open to the same weaknesses most adventure games are. A Golden Wake is worth a look in for the unique setting and interesting historical context, but is ultimately let down by its uninspired gameplay and lack of a cogent story. Your lead character is Alfie Banks, a friendly, polite realtor (I know, I couldn’t believe it either) who works in New York until his co-workers conspire into getting him fired. Moping around dejectedly, Alfie sees the adverts of wealth and prosperity down in Miami and heads there to seek his fortune. Upon arrival, he soon falls in with George Merrick, a business tycoon who is creating one of the first planned communities in the form of Coral Gables. The plot stretches over a number of years lasting from the early 1920s until the mid-1930s, following Alfie’s rise through the real estate business. The storyline doesn’t really have any overarching narrative; each stage of Alfie’s life feels self-contained and whilst he professes a wish to do better than his father, his character never seems like he has particularly strong motivation. Similarly, a number of breaks throughout the game jump you forward in time in illogical fashion, effectively putting the character development on ice. Alfie also makes a choice later in the game which feels a rather hammed, given he seems like such a straitlaced person up to that point. For the most part, the rest of the characters you interact with are based on real-life people. George Merrick really did establish the City of Coral Gables in the 1920s, and “Doc” Dammers really did assist him. All of the characters are treated with respect, as are the historical locations in Miami such as the Biltmore Hotel, which Merrick constructed in 1926, or the Venetian Pool, again constructed on Merrick’s orders in 1924. Voice acting is on the whole good; Alfie always sounds upbeat and ready for a challenge, whilst most other characters come across convincingly enough. The game’s one new card in the gameplay toolbox is character persuasion. At several points, you may need to convince a character to do something, and will be able go head to head to try and win them over. This feels rather like the “Character boss battles” from Deus Ex: Human Revolution, although generally shorter in length. You can also use your “seller intuition” to try and psyche out your opponent beforehand to gain knowledge of their personality, which will influence what tack you want to take. These scenarios are always interesting, and if you fail there is usually another way to get the information or outcome you wanted. The remainder of gameplay is standard for what you would expect from an old-fashioned adventure game, meaning that you will be finding items, using items with objects and very occasionally combining items to use on other objects in order to solve puzzles. The backbone of adventure games has always been this kind of busywork, but sadly some of the actions here are evidently contrived in order to extend time. You may need to repair an airplane so it will be flyable for an air-show, but need to steal a piece of machinery first. You know where they machinery is, but a policeman is guarding it, so then you need to figure out how to distract the guard. There are also one or two badly explained puzzles, such as one where you’re driving a car at the air show, or another where you must rearrange books on a bookcase. The problem with these puzzles is that they break flow; frustration sets in as there is very little signposting on what you should be doing, and nowhere can you check to see what your current objective is. From a graphical standpoint Grundislav Games really have nailed the 1990s adventure game aesthetic to a tee, and like the older Wadjet Eye games such as Resonance or Gemini Rue, A Golden Wake looks purposefully old-school. Even given the low resolution, environments are surprisingly detailed with flavour text, and hovering over paintings or objects in the world will usually provoke a new remark from Alfie. 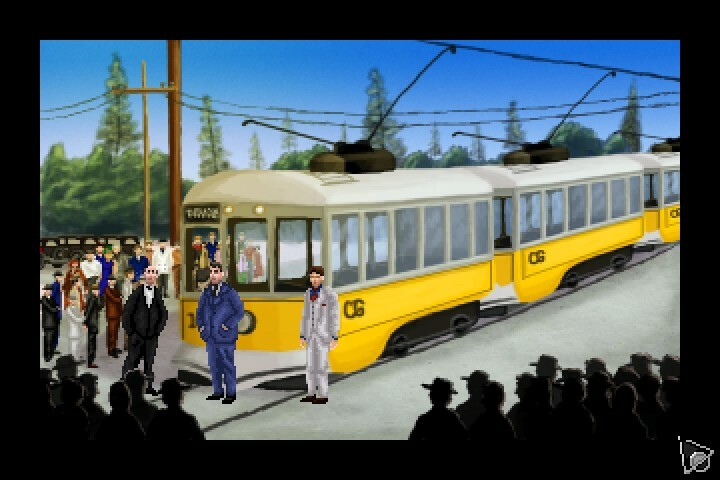 The soundtrack is also rather good, merging in some era-authentic swing and Jazz to give the game a lively or somber atmosphere where necessary. I have to commend A Golden Wake for its thoughtful and unique look at an era that has never been touched before in video games. Learning about the real characters and events of the Florida land boom is both fascinating and rewarding. With that said, A Golden Wake sadly hasn’t got a whole lot going for it besides its adoration of the historical subject matter, and once you reach the end, apart from a developer commentary exploring some more historical detail as well as the game design, there isn’t much enticing you back. With a more involving story and gameplay there could have been something great here, but it’s an interesting start nonetheless.